Ken Griffey Jr. is a retired MLB outfielder who played for the Seattle Mariners & Cincinnati Reds. Ken Griffey, Jr., nicknamed “Junior” and “The Kid”, is a former MLB outfielder who played 22 years for three teams from 1989–2010. He spent most of his career with the Seattle Mariners and Cincinnati Reds, and also played for a short time with the Chicago White Sox. Griffey, Jr. is a 13-time All-Star and considered one of the most prolific home run hitters in baseball history with 630 home runs to his name. Mike Piazza is a former Major League Baseball catcher who played for the Los Angeles Dodgers, Florida Marlins, New York Mets, San Diego Padres and Oakland Athletics. Piazza is a 2016 Hall of Fame inductee and 12-time All-Star who is often regarded as the best-hitting catcher of all time. Piazza also holds the record for home runs hit by a catcher with 396 (with a career total of 427). Sports Speakers 360 is a booking agent for pro athletes. 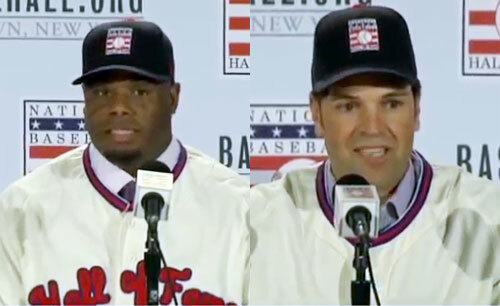 If you would like to book athletes like Ken Griffey, Jr. or Mike Piazza for a speaking engagement, appearance or endorsement, contact a Ken Griffey, Jr. or Mike Piazza booking agent for fees at 1.855.303.5450.